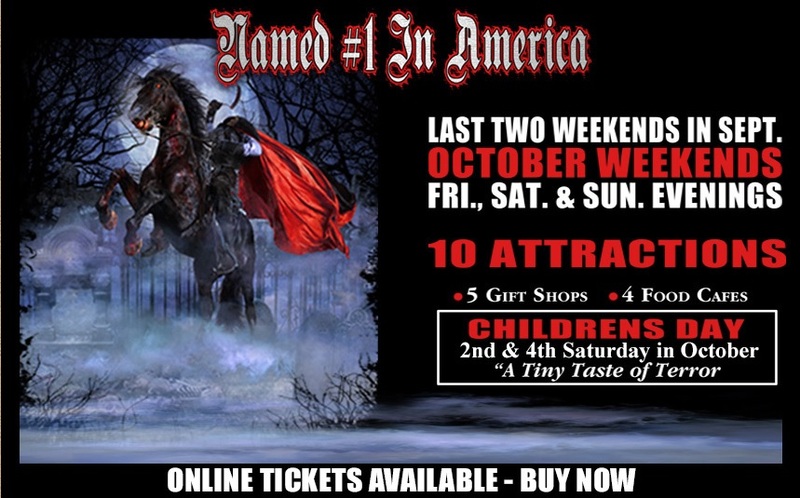 Headless Horseman Hayrides and Haunted Houses has the honors of being named #1 Hallow Scream by The Weather Channel, World's Best Haunted Hayrideby AOL News, voted America's Scariest Haunted House in the Northeast by MTV, #1 in America two consecutive years by HauntWorld Magazine, named #1 on the Planetby New York Daily News, "One of America's Best Hometown Haunts" by Fangoria Magazine, named #1 Outdoor Attraction by American Airlines, named #1 Scream Park and Hayride in America by HauntWorld Magazine, listed Number 1 by USA Today, and has been consistently named in the Top Ten Haunted Attractions by CNBC and AOL. It has been featured on The Travel Channel, Comedy Central, Emeril Live, Good Morning America, Nightline, CBS Evening News, The Today Show's segment "Sara in the City" and several national magazines. House, The Horseman’s Tomb, Dark Harvest Corn Maze, Night Shade Nursery & Greenhouse, Dr. Dark's Black Spider Circus Sideshow, The Feeding presents “The Pain Killer”, and Two Raven’s Manor with skilled stunt actors and a magic-illusion side show starring Ryan Dutcher. 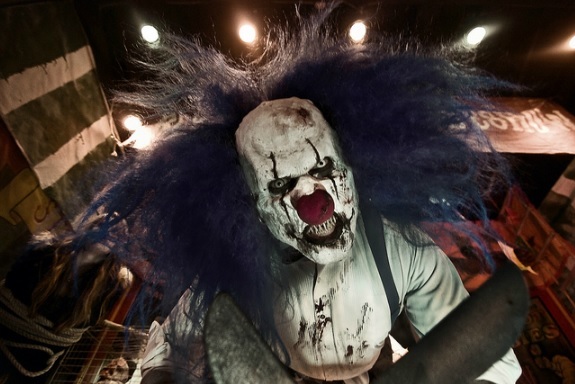 In addition, the creators of Headless Horseman Hayrides and Haunted Houses are proud to present a new concept of interactive, immersive entertainment. A real life escape experience "The Great Room Escape". A first for the Historic Hudson Valley. 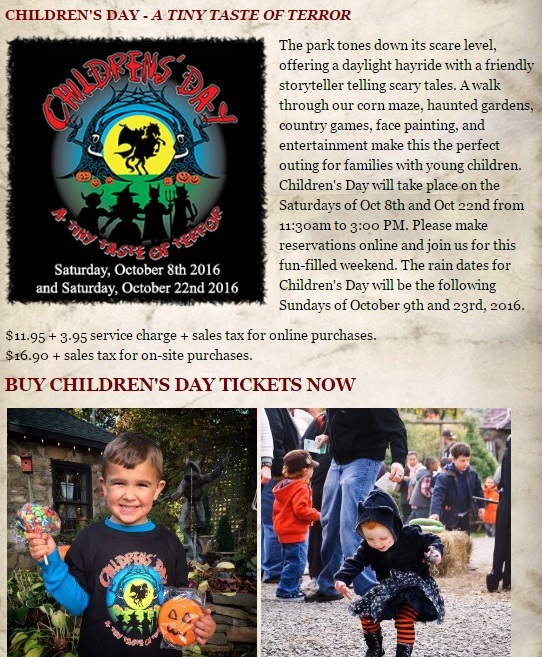 Children's Day dates for 2016 are scheduled for 11:30am to 3:00pm on October 8th and 22nd, with respective rain dates of October 9th and 23rd.